The area's biggest school district starts class soon, but thousands of students will have to find a different beverage of choice while they're at school. Starting Tuesday, the sale of sugary drinks will be banned in some Fairfax County, Va., schools. Like many teens, Nikki Stefanek likes to drink soda. "Sprite, Fanta," she said naming a few of her favorites. But some of her favorite drinks will no longer be available in her school's vending machines. 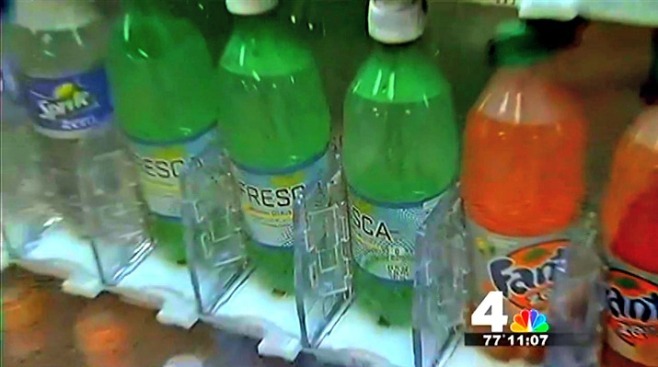 A new pilot program in Fairfax County is replacing traditional soda vending machines with newer ones that only sell healthy options like tea, juice and sugar-free sodas. Just seven of the county's 25 high schools are participating in the pilot program, which will last the entire school year. Currently, soda sales are allowed only after the end of the school day, and that will be true for the new machines as well. Drinks options will include diet sodas, diet and unsweetened teas, coconut waters and V-8 Fusion Juice. "Almost virtually nothing in the cooler now has calories expect the V-8 waters, and they're low-calorie...," said Wes Speer, the coordinator of Food and Nutrition Services. While unpopular with some students, other students and parents say the new machines are a good idea. Student Luis Pagan said, "I think it's a good idea, especially for the kids that play sports, because they should be drinking more water to stay hydrated." Sharon White, who is a parent, agreed. "I think it's a great idea. They don't need it, so water and iced tea, that's fine for them." The pilot program will be evaluated at the end of the school year. If the results are positive. the machines will be placed throughout the county.